This is a supplement for Jaws of the Six Serpents, our popular gamebook taking the PDQ system into the realms of sword-and-sorcery and the darker sides of fantasy. Because PDQ is so simple and flexible, it lets you lay out what's important about characters and get playing very quickly. 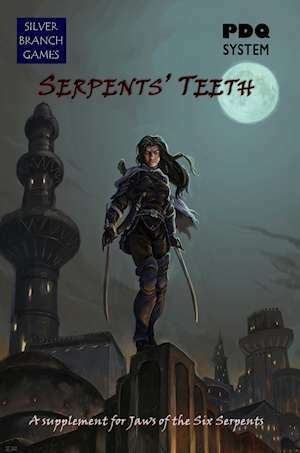 Serpents' Teeth is a resource for the GM, with adventures and guidance material, mostly by fans of Jaws who have run it in their home groups and at conventions. You can also use it with other sword and sorcery games: character write-ups are so simple that you can easily convert to your system of choice. Note: some of the material is not suitable for a pre-teen audience. This title was added to our catalog on June 19, 2012.